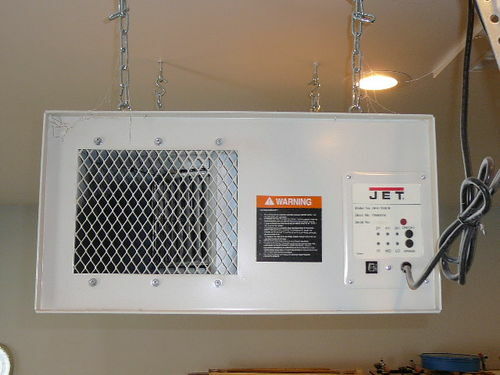 I ordered a Jet air filtration system several months ago and have been putting off a review until I had plenty of experience with its performance. I hung the unit in the middle of the shop with the inlet oriented towards the area where I do most of my sanding and dusty work. I typically turn the unit on when I’m sanding, planing, routering, or using my table saw for an extended length of time. My belt and random orbit sander are attached to a shop-vac to pull off most of the dust. The table saw and planer both are connected to the main dust collection system. When I use the router table it is also connected to the dust collection system. Hand router work is not connected to anything and generates huge amount of dust. I typically turn the unit on the low speed setting except when I’m planing I use the medium setting and when I’m hand routering or cleaning the air before spraying I turn it on high. I will also turn on the unit when I finish projects using my HVLP spary system and poly-urethane finish. By its nature, there is a lot of overspray and the unit filters some of it out. The unit is loud, especially on the outlet side on all 3 speed settings. Since I’m wearing ear muffs, it isn’t an issue to my hearing. 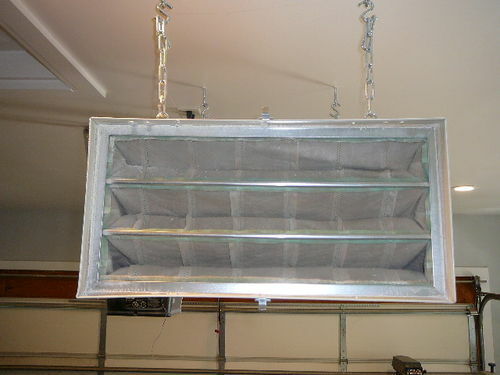 The inner and outer filters are dirty which means the unit is filtering dust out of the air. However, I still have a lot of dust settling on everything which means that it isn’t cycling the air fast enough. That probably means it is too small for the area despite product claims that it is the right size for a 2 car garage sized room. The timer is nice if you want to leave the unit on to clear the air while you are out without having to remember to come back and shut off the unit. The replacement filters are not cheap. 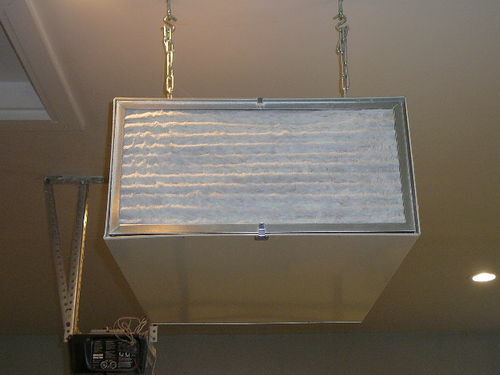 Inner filter $65, outer filter – washable $35, disposable $22 12×24x1 which is not sold at the local big box store. The washable filter is not washable, I vacuum it off periodically but even that is hard on it. The outer filter does not fit well into the opening. There are gaps around the sides which lets larger particles into the inner filter causing it to blind off faster. As I mentioned, the unit is loud. Ultimately, there is still a lot of dust that settles on everything even with the unit operating at high speed. Same goes for over spray when I’m finishing. I like mine well enough…. I typically buy the paper filters from Home Depot or Amazon which are usually the Purilator brand. I blow them off outside with HP air a couple times before I replace them. I suspect it all comes down to what your expectations are and how well your dust collection is. I can sand a panel with the air filter on medium and a shop vac hooked up to the jitter bug, and the DC sucking on a down draft table and then finish the panel with shellac an hour later and not see any dust nibs, so I’m a happy camper. The residual dust from my shop mostly comes from tools that either have poor hook ups to the DC or none at all. If you’re getting vibration noise, try using heavy rubber bungy cords to mount the unit to the ceiling instead of hard mounting it. This reduced a lot of noise for me. We have that unit as well and buy these filters from Amazon for a little over $6 each. I was under the impression the filter is supposed to be placed near the edge of an area so it can set up a current in the room. That way the air will keep moving and not drop as much dust. Rob – good to know that they work. I’d read that others have had problems getting non Jet filters to fit in the opening. Matt – your comment about residual dust is spot on which is why I’m focussing more on dust collection and less on air filtration to help keep things clean in the shop. My filter is hung from chains so vibration doesn’t appear to be the cause. It is definitely coming from the fan. I have had mine for some time and have been pleased with its performance. I too use afternarket filters from Home Depot. I would caution that this is not designed to filter overspray from finishing. I would imagine that would crap up the filters pretty darn quick. I use these MERV 4 filters in mine. At $26 for 12 filters, it’s hard to beat the price. I found that higher MERV filters simply clogged quickly and reduced the air flow. Bought and installed one a few months ago. Have it in my garage with the filters facing the back of the garage. I placed it on chains on my ceiling. The unit is offset to one side of my garage. My concern was where to place it in reference to my bag dust collection system as dust leaks out of that as well. Seems to work well for me. Few issues I have my garage door doesnt seal well. There is always a 2 inch gap at the top or bottom of the door. I’m currently cutting a lot of mdf which is dusty, no way around that. At the end of the day the outer filter is caked with dust. Means it is doing a lot to me. I vacuum the filter off to freshen it up after each day. I picked up the small Grizzly model 2 years ago then found out the only place to get the filters was from Grizzly in the the States, had to mail order replacement spares! I blow the dust of the pre filter and inner filter and wash inner one about once a year, Found when I switched to a cannister filter on my Dust Collector the amount of dust in the shop decreased dramatically! I have the Powermatic, but I am happy to learn of alternate filter sources. My filter is hung from chains so vibration doesn t appear to be the cause. It is definitely coming from the fan. The fan on my unit is pretty badly out of balance, which is my only real complaint. I originally hard mounted mine to keep it as high as possible in my basement shop with a 7’ 6” ceiling. Thought that was great until went upstairs to where my wife and daughters were watching a movie and was surprised to feel and hear how much the floor was pulsing. The bungie mount totally solved that problem though. I’ve read that many guys have problems with their remotes and signal interference from fluorescent shop lights, but have fortunately not had any such problems. I wish the remote signal “bounced”... but as it is, I have to aim it at the control panel… which means walk to the other side of the shop. I can easily reach the unit, so remote doesn’t do much for me in the long run. I didn’t want to pay the crazy prices for factory filters either. I built an enclosure from thin plywood that fits over the front and holds a standard furnace filter. They cost about the same no matter the size so, since I had the space, I designed it for a big one to get maximum filtration. Now I buy filters (MERV 11) at the home center when they go on sale. I do like to run the unit when I spray to pull as much overspray into the filter as possible. That was one of the reasons I originally bought the washable version. I figured I could wash it off after the spray set. That sort of worked along with getting a scrub brush the scrub off the build up. Unfortunately, the filter batting did not hold up nor did the wire mesh behind it. I going to build a prefilter box like OhioMike if for no other reason than the insane cost of replacing the inner filters ($65). Thanks to everyone for providing not only comments, but experiences and best of all, pictures of their set ups. I bought two of the Grizzlies about three years ago, and am always amazed at the unbelievable amount of dust in the filters when I clean them. I mounted them to work in a circle of air above me. I am also amazed at the amount of dust that still settles on all the surfaces of my shop. I think most of these box units that mount overhead are overrated. I have a small shop, so no large dust collector. I use two large Rigid vacs with HEPA filters in them that I hook up to a machine when ready to use. I find that when doing heavy sanding, or lathe work, (any spray finish is done outside the shop in open air), I mask up with an actual respirator with cartridges, not just the little paper masks. 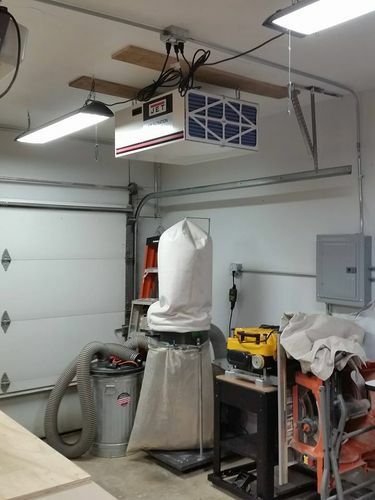 I have too much money in my assorted dust collection devices, but really – the best thing for dust control that works for me is that I have a huge covered carport attached and just outside the shop door. I take a lot of project steps out there to avoid so much dust inside the building. I like mine a lot, and my Dylos meter confirms that it works very, very well removing particles in my two car garage workshop. I use activated charcoal aftermarket filters that I purchase at Filters-now.com They help both with overspray from my HVLP, solvents that evaporate, and, of course, wood dust. I like the looks of the double inlet StumpyNub modification but have not tried it yet. The inlet filter clogs up the most. Every year or so I take out the internal filter and shake it out and it’s not a problem for me. The discharge modification would be my second thing to try – probably never. The last minute of the video has the inlet mod.